For me, Aëdle is to audio product packaging in the same way Jean Paul Gaultier is to mid-tier crafty and eye-catching Eau de Toilette designs. There is nothing bland about what Aëdle do when it comes to packing almost as an art form and the $360 ODS-1 hybrid IEM, their first ever IEM, is certainly a statement in eye-candy. You could almost argue that, at least from the outside, it would not be surprising if you found the ODS-1 lining up beside a Gaultier creation at some duty-free store near you. Putting aside the swish and presentation for a moment the ODS-1 is, in fact, the first IEM created by Aëdle of France. 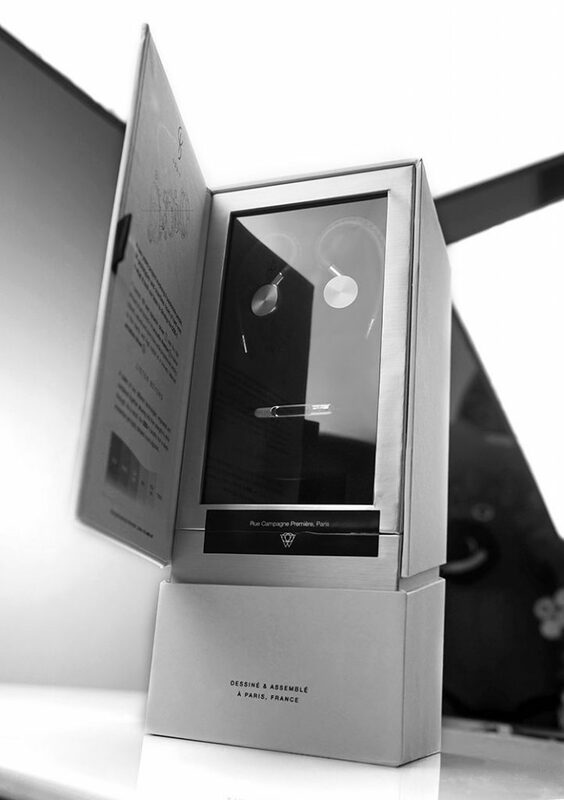 We know their history and worked with them before for a review of their VK-1 and it was equally stylish dynamic portable headphone with a dark but clear sounding presentation with an emphasis on smooth and above average mid-range clarity. It is hard to believe that is over 3 years ago already and though they have expanded the options on the VK-1 the ODS-1 is the first true “second audio product” in their lineup. The ODS-1 is a hybrid design IEM with a single 10mm custom designed dynamic driver for the low to mids and a single BA for the top end though Aëdle prefer to focus on the clarity and resolution strengths of the BA and the natural low-end performance of the dynamic driver as being the sum of the tonal parts of the ODS-1. The dynamic driver itself is a titanium built diaphragm with neodymium magnets that in theory should produce a far tighter bass response than regular ferrite magnets using in other dynamic driver designs. Rated at 32 ohms with a decent SPL of 109dB Aëdle are pitching the ODS-1 as an IEM that an audiophile will get plenty of satisfaction out of with stronger amps and low noise a potential feature. Yet at the same time, with that beautiful packaging, it will also appeal to a certain discerning gentleman or lady who want to their music to sound good from a smartphone and generally not stick out like a sore thumb. The clear pitch is very similar to the concept of what you put in your bag for travel purposes and the demographics is somewhere in the mid 20’s upwards in terms of those who take their travel kit fairly seriously. The design is on the same level as an expensive toiletry kit with the accessories, such as the travel pouch, sharing a similar vogue. The packaging itself is reminiscent of an Eau de Toilette in terms of the unboxing experience but is also in keeping with their design lines from the previous VK-1 design lines. It is very much an Aedle creation and as such once again I expect these to be in lifestyle and garment outlets as well as audio stores. The ODS-1 is a fairly large but shallow 2-piece machined aluminum cylindrical designed IEM. It has a solid silver coating finish on the top and a black finish on the bottom leading out to a fairly shallow nozzle. The ODS-1 is designed to be worn over the ear with detachable MMCX sockets. Combined solid matching metal design MMCX connectors on the cable with the fixed curvature of their cable memory hooks its aesthetic is more akin to a flowing singular piece of craft rather than bits and pieces joined together. In many respect the design mirrors that of the original VK-1 headphone right down to the color combination used, giving both a harmonious and elegant look and feel if sat side by side. Previously I used the phrase mature and stylish ‘metrosexual’ to describe the VK-1 and the ODS-1 is now too far off that mark either. Certainly, compared with other IEM designs at this price point, the ODS-1 is one of the most striking. There is one caveat to this great design, there always is, and that’s the cable itself. For those who do not wear glasses, the ODS-1 cable is actually rather easy to work with if a tad thin and rubbery. It is approximately 1m in length and comprising of OFC wire encased in a polyethylene sheath and terminated at the top end with gold-plated MMCX connectors. At the input end, there is a single 3.5mm gold-plated jack with a silver aluminum branded casing. Both the y-split divider and inline remote playback and mic are also finished in a matching silver coated aluminum alloy yet fairly light and easy to manage. It does lack a chin strap though. Unlike mere ‘mortal memory hooks, ‘ the ODS-1 hooks are fixed in curvature so you cannot make brand new curve designs but they do offer a degree of movement or flexibility to allow for micro adjustments around the ear. They are also handcrafted and stitched from some gorgeous looking Italian leather that is pretty soft and not as stiff as you might think despite the fairly large girth it adds to the hook dimensions. For those that do wear glasses then that is the caveat I am afraid. The leather is beautiful but once you put them over your ear, they leave little room for glasses especially with the fairly fixed curve form and thickness of the hooks themselves. Of course, with MMCX connectors you can detach the cable and use your own cable of choice to get around that but that is presuming you have your own cables and somehow I feel the coolness of the design will be diluted with an aftermarket cable also. 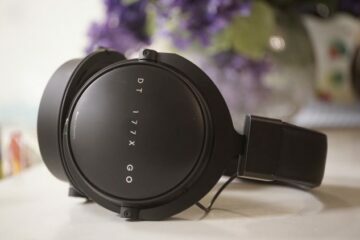 Setting aside the glass wearing issue the ODS-1 is pretty comfortable over the ear with its soft leather hooks providing ideal levels of support if not quite the same level of flexibility as true memory wire. Once in place, they shouldn’t move around too much if all and impressively exhibit only tiny amount of microphonics. The shallow depth of the nozzle, however, does place a bit more emphasis on the tip in use to get a fairly good seal. The best seal is with the supply foam tips which have a slightly longer stem than the stock single bore silicone tips and do a much better job in terms of passive isolation. With the foam tips, I get a pretty rock solid level of isolation from background noise and a seal on par with most IEMs that use foam tips. With the silicone tips, the insertion depth was shallower with a more porous seal letting in a higher level of background noise. 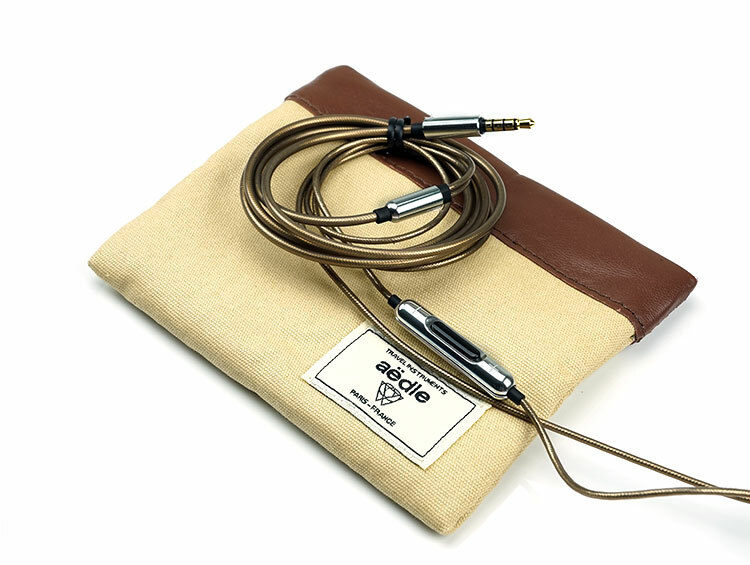 I have worn a Jecklin Float MK2 in public and lived to tell the tale so I am not one to be hugely swayed by packing when it comes to buying an earphone but having said that the Aedle ODS-1 is pure class for accessories and packing. Nothing comes close to it in this price category in that respect. Sure, Westone and Campfire Audio are sleek, smart and well thought out in terms of tips and cleaning brushes and nice cases but this is almost an art form from the French manufacturers. 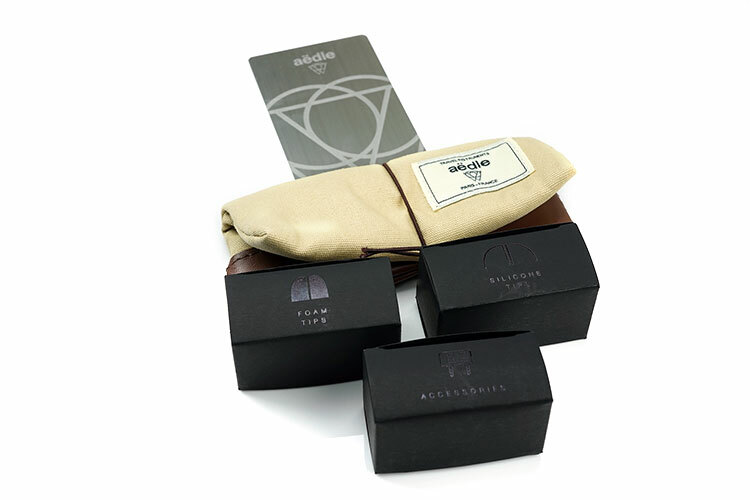 Inside you get a soft toiletry style snap travel pouch and 3 boxes all neatly laid out in the bottom of the retail box like luxury soap cartons. Each one is uniquely labeled with foam tips, silicone tips, and accessories (airline adapter). There are 3 sets of tips in both foam and silicone and come in the usual small, medium and large sizes. The only thing missing is a quarter jack adapter and a cleaning pick. The case is a two-tone beige fabric finished in a darker tan leather lip that seems to be automatically fastened with small magnets or a flexible plastic ring. The front is adorned with the Aedle moniker on a stitched lighter off-white label and the moniker “Travel Instruments” as the strapline just above the main logo. Below, proudly on display is “Paris – France”. Inside the case, it is lined with a beautifully stitched satin finish in a matching beige color. It is roomy and flexible enough to house not just the ODS-1 but all the tips in their bags also with room to spare. It is long, it is elegant, it fits in with the brand ethic of Aedle and it does a mighty fine job of showing off the ODS-1 with as much panache as one can muster. This is pure eye candy and will turn heads from any retail shelf. I dare say plenty of money was gone into developing this box but it is one of the few that I think was actually worth it. I normally put retail boxes in a plastic container with silicone bags once done with but not this one. This one is on my office desk because I like showing it off. The ODS-1 has a u-shaped tonal balance with an emphasis on a fairly dominant low end with a warmish sheen, a dipped lower midrange with a slightly elevated vocal presence and a rising and more energetic upper midrange. Treble is boosted but not overly so which is why it is not an overly emphasized v-shape for me, rather more of a gentle boost with that single BA carrying most of the work. As such it is not a sharp sounding or harsh treble performance and plays second fiddle somewhat to the more dominant low end of the ODS-1 presentation. Use of foam tips will further pull back the treble response but at the same time adds a little bit more body to the BA performance. Staging wise with that lower midrange dip instrumental work is a bit further back than vocals yet vocal are not overly forward either so it is not an intimate soundstage by any means but neither does it struggle with clarity and midrange detail. You will get more depth and decent height than out and out width and razor-sharp imaging. Overall this is a musical and colored IEM more for PRaT and easy listening without fatigue than analytical accuracy and critical listening. It is the kind of IEM that will suit modern pop and rock genres more than classical works though its warm timbre makes it a good match for husky female jazz vocals that pitch around contralto level upwards. The 10mm custom titanium driver is the calling card of the ODS-1 and influences most of the listening with them in terms of balance and preferred choice. This is a full sounding low-end with plenty of body. Sub-bass presence is good, there is decent rumble from the DD driver but the boosting is most prominent around the 100Hz marker so the mid-bass impact is more emphasized and sustained and from around 250HZ onwards it starts dipping into the lower mids to around 1-2k. Two things though I must remark on. Yes, it hits hard and it is fairly north of neutral but at the same time, it is not an overly soft and ill-defined mid-bass boost. It does not sound overly bloated, veiling the mids and making the whole performance sound unsatisfyingly muddy. It has a decent snap for a DD and whilst I get that nice natural pace and delivery of a dynamic driver it is not one of those cheap sluggish versions with annoyingly long decays slowing the whole thing down. Lower mids are slightly dipped and positioning is behind an elevated and smooth vocal stage. Aedle have done a good job of keeping the bass from bleeding into the mids and a dipped lower midrange will prevent that and at the same time retain a nice degree of clarity and separation that always seem to work really well with modern dance and RnB. Normally this would be my cue to tell you that instrumental work is slightly thin sounding with that dip but not on the ODS-1 which retains a surprisingly good level of body throughout. I get the feeling this driver is more about strong bass performance than a weak mids response. Timbre is warm to neutral also so if anything the mids on the ODS-1 actually sounds more neutral to natural with a nice turn of pace. Resolution is also pretty good, you’ll hear decent micro-detail, and those smooth sounding vocals have a good sense of space around them so they rarely feel like they are competing with everything else. Energy starts picking up in the upper mids and lower treble with a small peak around 7-8k and another minor bump around 12k but nothing heavy duty or harsh sounding. Treble on the ODS-1 is delivered primarily from its single BA and it is well tuned in that respect though still slightly in the shadow of the DD’s low end. It does show a nice level of control with sibilance rarely evident on edgy tracks, high pitched breathy vocals or heavy duty percussion attacks. It has just the right amount of sparkle and articulation without ever sounding fatiguing, brittle or terribly uneven in its presentation.